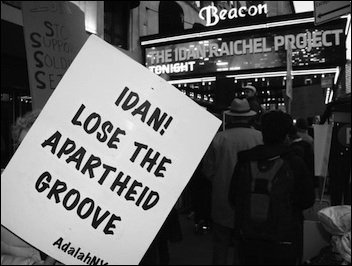 Originally published under the title, "Left Protests at Idan Raichel's NY Performance." An anti-Israel protestor camps outside the April 12 Idan Raichel concert in New York. 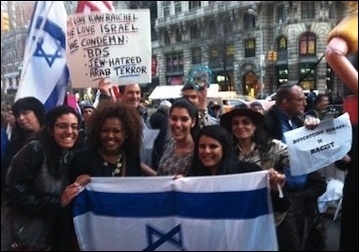 On the evening of April 12th, on Manhattan's upper West Side, the usual anti-Zionist and pro-Palestinian groups such as Adalah-NY, the BDS National Committee, and the Palestinian Campaign for the Academic and Cultural Boycott of Israel protested the performance of an Israeli musician. All twelve of them came, wearing jeans and survivalist vests and looking very Downtown, very Brooklyn. They had a sound system that blared anti-Israel, angry "black"-style rap hate music. Most were white leftists; two were visibly Arab-looking. At least 70% of the protestors were, I am sorry to say, white women. One identified herself as a Jew. I asked for a brochure. It read: "What kind of musician is an ambassador for apartheid? Serenades soldiers who destroy homes, lives, and land? Feels happy with a state characterized by racism, violence, and land theft?" My friends--welcome to Upside-Down Land. 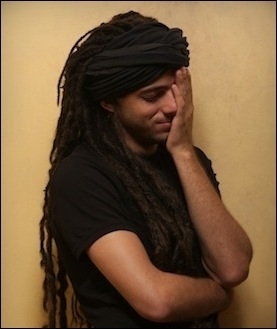 Idan Raichel, Israel's alleged "ambassador for apartheid." The musician these groups tried to boycott is none other than Idan Raichel, one of Israel's most popular musicians, and the one most responsible for introducing black and "ethnic" (including Ethiopian, Yemenite, Arab, and Sudanese) music into Israel, and for supporting it globally. I have been told that Raichel used to wear the longest Rastafarian dreadlocks. He is responsible for fusing electronics, Hebrew texts, Arab, and Ethiopian music; he welcomed non-Jewish refugee musicians, including Cabra Casey, from a refugee camp in Sudan. And this is whom the white woman who wore a button that read: "Black Lives Matter" chose to boycott. In organizer Richard Allen's opinion, the anti-Zionists were "overwhelmed by the pro-Israel counter-protestors." Allen has a point. The pro-Israel forces numbered between 125-200. They sang, they held Israeli flags and posters, they launched a huge inflated Pinocchio—to respond to the Big Lies being told by the Other Side. I counted twelve-fifteen police officers and one bomb-sniffing dog. Richard Allen also said: "The Jewish organizations are nowhere on this. They are not looking after the Jewish people. The leadership is holding cocktail parties fundraising for the New Israel Fund. Again, he has a point. Pro-Raichel demonstrators came out in greater numbers on April 12. On the side for Israel: A woman with a bright, fierce countenance told me she was a ninety-year-old Holocaust survivor. She said: "I will never stop fighting for Israel." Her sign read: "Boycotting Israel is Racist." And then there was the woman whom I asked to estimate for me how many pro-Israel demonstrators she thought were there. She said: "Six hundred thousand. Everyone who left Egypt is here today." For Israel. There they stood: One Asian woman, one Black woman, several Mizrachi and Arab-looking women and men. People of all ages, including children and teenagers (at least five), but mainly fifty and older were there. I covered this protest with an Israeli companion who could not resist blowing my journalist's cover. She engaged with one of the white pro-"Palestine" women and told her that "the people you are covering for endorse genocidal hatred and violence." The response, straight out of the Ivory Tower of multi-cultural relativism was this: "We have our narratives and you have your narrative." At the moment in history when Syrians are massacring Palestinians in the Yarmouk camp, about which neither President Obama nor the PLO seem to be doing anything—this is how anti-Zionist pro-Palestinians chose to spend their time. Phyllis Chesler, a Shillman-Ginsburg Fellow at the Middle East Forum and recipient of the 2013 National Jewish Book Award, is the author of fifteen books, including Women and Madness, Woman's Inhumanity to Woman, and The New Anti-Semitism.